I passed by an open door and spied heraldic splendor on the ceiling, and my inner geek let out a slightly audible squeal. On the door reads Biblioteca Palagio di Parte Guelfa." People were reading intently and looking serious. 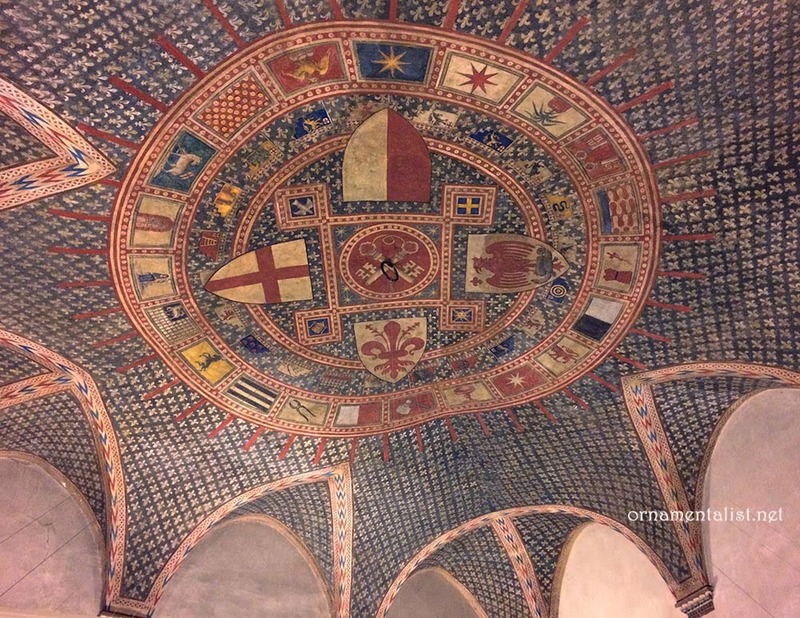 I ventured inside and studied the ceiling trying to read the various symbols, my brain whirring away trying to access what Florentine history I can recall, my hand hovering over my camera bag like a gunslinger waiting for just the right moment to draw. 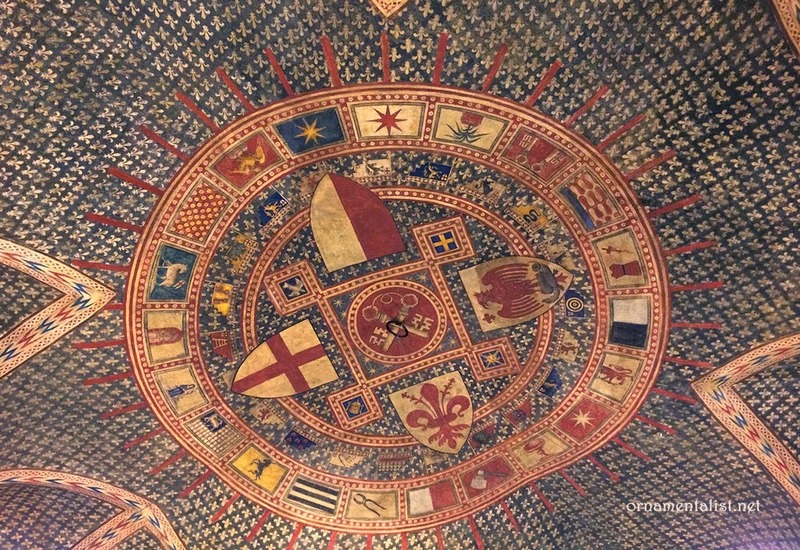 Heraldry isn't just for noble families: I recognized the banners of the Arti, Florentine guilds who were active in commerce, as well as politics. 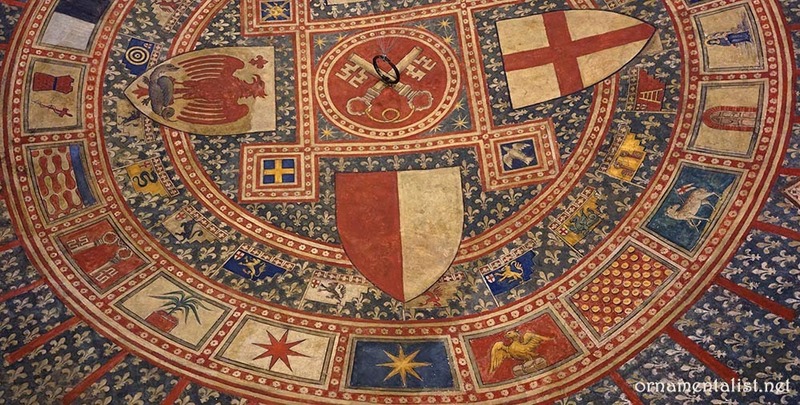 The shields of two major guilds, the Arte di Calimala and the Arte dei Linaioli e Rigattieri, both textile guilds, take pride of place in the center along with the Florentine city shield, and that of the Guelph party. The Guelphs, whose shield is white with a red cross, had a complicated and often bloody religious and political rivalry with the Ghibellines, whose shield was red with a white cross. Theirs was an epic medieval conflict which persisted in various mutations well into the 15th century. 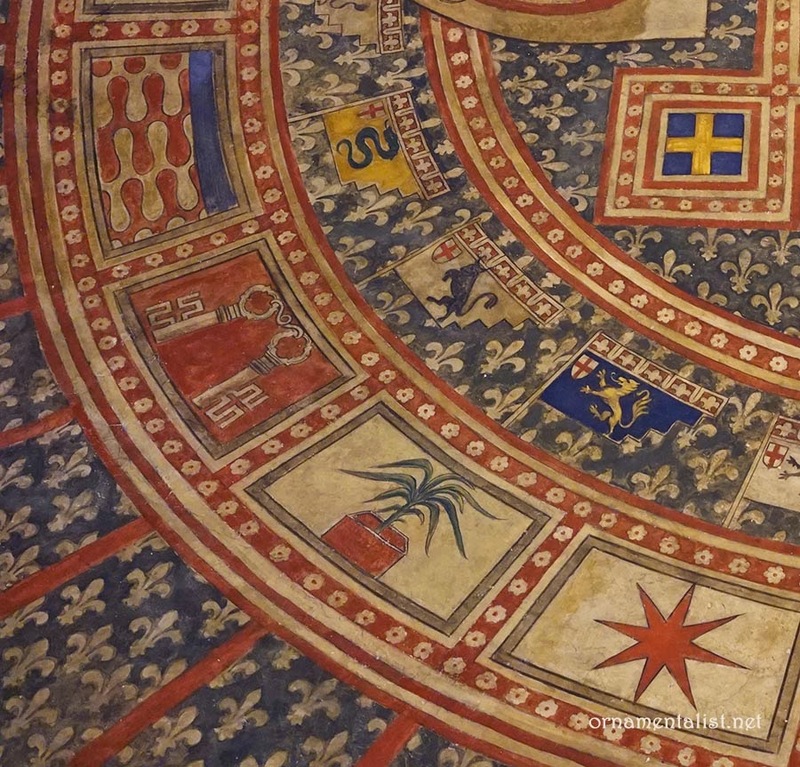 Encircling the shields in the center is a marvelous graphic border with the insignia of each of the Florentine guilds: stonemasons, speziale, blacksmiths, innkeepers, tanners, locksmiths, etc. Surrounding all this is a field of deep blue patterned with the French fleur de lis, possibly a reference to one of the (brief) periods of good relations between Florence and the French Crown. Painted entirely by hand, each feature varies just a bit which really adds to the patina and feeling of history. It almost looks like the banners are fluttering proudly overhead. It's just great ornament and you all know how I feel about that. I am geeking right there with you! just wait Theresa! I found another one today! An incredible ceiling, and, I might add, great ideas to store away in the memory banks. I really like those curious stepped banners — I've never seen flags shaped like that!